I could be wrong BUT, I think Joran's smiles were about being arrogant and being forced in a situation where there will actually be consequences. IMO, he's very aware of the satisfaction most people will get out of seeing him held accountable and the smiles and nodding off were a feeble attempt to portray that he's not really effected by what goes on around him. It's a thin facade.............. he hates this and is probably jelly inside. He's a coward at heart. I agree!! He must NOT show that he is scared...which I believe he is! He must put up a front! The murder trial of Joran van der Sloot, a central figure in the disappearance of American teenager Natalee Holloway, was postponed for five days by a judge in Peru today. Update at 11:29 a.m. ET: A Peruvian judge has postponed the murder trial for Joran van der Sloot until Jan. 11. Update at 11:20 a.m. ET: Van der Sloot entered the courtroom today in a blue blazer and faded blue jeans with a bulletproof vest beneath the jacket,the Associated Press reports. He sported a crew cut and wore a long-sleeved gray shirt. His defense attorney, Jose Luis Jimenez, tells the AP that is a 70% chance Van der Sloot will plead guilty to killing Stephany Flores in Lima in 2010, which could help him get a reduced sentence. Flores' father, Ricardo Flores, tells the AP today that the family would participate in the trial in hopes of ensuring that Van der Sloot is also accused of robbery in connection with the killing. Prosecutors are seeking a 30-year prison sentence on murder and theft charges. Jimenez has said he would seekto get a reduced charge by arguing that his client was in a state of emotional distress when he killed Flores. A lesser sentence would be from eight to 20 years in prison. Police and Flores' family dispute Van der Sloot's version of her death. They say he was hard up for cash and knew the Peruvian business student had been winning at the casino. "We hope that throughout this process our attorneys can demonstrate the true motives for the killing of my daughter," Ricardo Flores says, the AP reports. If a 30 year sentence requested by the prosecutor is forthcoming ... the implication is that Joran can be released after serving only a third of his sentence. If the court excepts a "simple" murder plea ... the implication is that an 8 - 20 year sentence implies that Joran could be released in 3 years. Prosecutors are seeking a 30-year prison sentence for Van der Sloot on murder and theft charges in a trial that will be held at Lima's Lurigancho prison. He is accused of murdering Flores with "ferocity and great cruelty," and prosecutors say he also stole 600 soles, about $220, from the victim. The defense will argue that Van der Sloot killed Flores in a state of emotional distress. "We will challenge the aggravating factors (charged by the prosecution) and seek to reduce the charge from first-degree murder to simple homicide," Jimenez said. That charge carries a prison sentence of from eight to 20 years. He said his client, whose prominent lawyer father died of a heart attack on an Aruba tennis court in February 2010, was in a fragile state from years of being under suspicion for Holloway's presumed death and other legal problems stemming from that case. "The killing was impromptu. There was no planning to carry it out," Jimenez said. Van der Sloot's defense attorney Luis Jimenez Navarro tells In Session this was a big win for his client. If Van der Sloot is found guilty and sentenced to the maximum penalty, under Peru's jail reduction credits, he may only serve a third of the time. The Flores family remains hopeful this will not be the case. An attorney for the family tells In Session under the Peruvian justice system the charges could change once the trial begins. "We can ask the Prosecutor to modify the indictment as new facts come out during the trial, but on the first day of trial we expect Van der Sloot to plead guilty to both charges. It seems this will be in his best interest,“ the attorney said. I know what you mean CBB. But it's a Sloot, so no surprise really. I know, Muffy. I'm not discouraged, really. Joran stepped in it this time and he's not going anywhere but back to prison. Whether it's for 30 years or to serve a life sentence, it will be for the duration of his life, IMO. I have to believe that after the trial, his prison experience will change drastically. I still believe that the Flores family, if nothing else, have enough influence to insure that his time spent there is to their liking. CBB, I agree. I think the Flores family has influence and will use it. The businessman Ricardo Flores, father of the girl Stephany Flores Ramirez, allegedly killed by the Dutchman Joran van der Sloot in May 2010, today expressed confidence that judges do justice for her daughter. Minutes before the start of the trial, taking place in San Pedro prison (ex Lurigancho), Flores said the defense is giving van der Sloot distorted versions of what really happened, so he asked the judges to be firm and transparent. He was surprised, for example, the statements of the defendant's attorney Cotrina Aldo, who hinted that the Peruvian justice system is plotting against van der Sloot to convict him of crimes against him. "It is shameful what he has argued, everyone has their way of defense, but the Peruvian justice system has made it clear that we have not any pressure exerted on the court," he said. Noting that the suffering that it causes the disappearance of her daughter last for life, Flores reported that family members expect the trial to end the cycle of death of his daughter. "(Stephany's death) is a wound that will never be closed. When you bring a child into the world bring an illusion, she was my only daughter, who had great future, but the Lord wanted me to be at his side. We want this cycle will end once and never again talk to the media about this issue but on others, "he said. He said he would have preferred not to attend the beginning of the process, but that was cited by the Third Criminal Court for inmates in jail. "I would rather not come. We would not be necessary, but I was called and I am respectful of the laws. Judges have called me today and I would ask you not to do it again, because they cause harm to my family, "he said. Joran's arrogance? Does Joran have knowledge of the the outcome. The victim's family, including her father Ricardo Flores, had pushed for stiffer charges and claimed that van der Sloot hasn't looked "remorseful" in court appearances. "He had an indifferent and prideful attitude. He looks as if he has everything under control. He looks better than when he appeared on TV after he was arrested," Ricardo Flores told CNN last year. 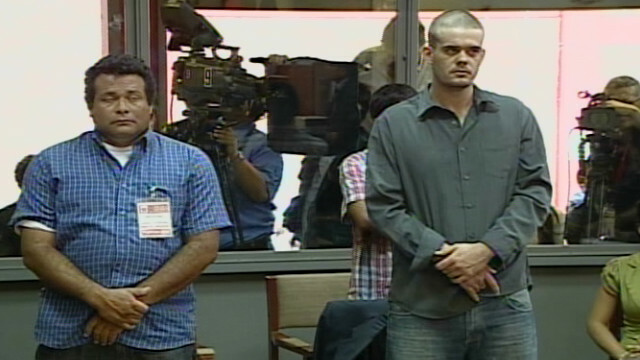 Joran van der Sloot, right, appears in court Friday in Lima, Peru, to face charges in the death of a Peruvian woman. Tune in to HLN's "Nancy Grace" at 8 and 10 p.m. ET Friday for reaction and analysis in the Joran van der Sloot case. (CNN) -- Joran van der Sloot on Friday asked for more time to "reflect" on what plea he will make during his murder trial. Earlier in the day, his attorney said van der Sloot was expected to plead guilty to all charges, but when it came time to tell the court, he asked instead for more time. When asked for a plea by the magistrates, van der Sloot said he wanted to give a "sincere confession" -- a type of guilty plea that can qualify him for a reduced sentence -- but did not agree with all of the charges against him. When the judge asked for clarification, he said he needed more time to decide his plea. The trial is postponed until Wednesday, when van der Sloot is expected to finally give his plea. He is charged with "qualified murder" and simple robbery in the killing of 21-year-old Stephany Flores. LIMA, Peru-- A Peruvian judge has postponed the murder trial for Joran van der Sloot to Jan. 11. The 24-year-old Dutchman entered the court Friday in a blue blazer and faded blue jeans with a bullet-proof vest beneath the jacket. What I understand from comments on other sites is that Joran wants time to consider if wants to plea guilty or not. I understand that he wanted to confess but not at the exact complaint of the prosecutor. Thanks EURobert and everyone else for the links. Seems like Joran wants to confess on his own terms. I guess he doesn't like that 30 year sentence and wants propose his own terms that he likes better (which will be 5 years with times served). Sorry Joran you don't get to make your own rules. Joran's going to have a difficult time making the case that Stephany's murder was "spur of the moment". His computer browsing history proves that he was very aware of the 5 year anniversary of Natalee's death. It also shows that there was no search on his laptop related to Natalee for the duration of time Stephany was with Joran. It's far more plausible that Joran targeted another young girl to commemorate Natalee's murder. Stephany was in the wrong place at a predestined and orchestrated wrong time. The "coincident" of the 5 year anniversary is way too far a stretch. The brutal murder of Stephany Flores would not have happened if a corrupt Aruban investigation had not prevented justice from prevailing for Natalee Holloway. 47:50 - "I feel strongly that he (Joran) is a time bomb that is waiting to go off. He will strike again. It is not just for Natalee that I would like to see him behind bars. I think he has shown us all he has no control over himself or his actions." I hope Joran remembers that whatever the length of time he ultimately serves for Stephanie's death, he will be headed to Alabama. He really doesn't want to come here. No matter how old he is. Yes, Joran.............. Beth is watching you as you face the consequences of your actions. Yes Joran, all of Natalee's supporters are watching as well. We all saw you remove the bullet proof vest and the yawns and the smiles. You are a tiny fish in a glass bowl and all eyes are laughing at your feeble attempt to show the world you don't care. Someone has put a lid on the fishbowl and there's no way out. Toto? You aren't in Aruba anymore. After nearly two-hour hearing in which the Attorney General explained the scope of his indictment on the murder of Stephany Flores Ramírez, the Dutch defense Joran Van der Sloot asked to School "B" of the Third Criminal Court for Defendants time in prison for his client to assess if you elect early termination of the process. The request was accepted by the prosecution and by the Flores family's lawyer, Edward Alvarez, so that Judge Victoria Montoya Peraldo suspended the trial until next Wednesday, the day the poker player must state whether you plead guilty or no. During the hearing, the Dutchman said it intends to make a sincere confession, but said he did not agree with some parts of the indictment which the prosecution asked to be sentenced to 30 years in prison for the crimes of homicide and simple theft. "I want to take me to my sincere confession, but I do not agree with all the aggravating circumstances of the Public Ministry," he said. The other defendants John William Aparcana Pisconte, John Oswald and Carlos Alberto Aparcana Euribe Pisconte Pretil-who drove the car in which the Dutch fled the country bound for Chile, where he was captured, also asked for time to see if they make the conclusion in advance. The public prosecutor had requested five years in prison for them. Vizcarra Beatriz, spokeswoman for the Superior Court of Lima, said that if Van der Sloot is guilty, the court will issue its ruling within 48 hours. Yes, Joran.............. Beth is watching you as you face the consequences of your actions. Yes Joran, all of Natalee's supporters are watching as well. If justice prevails for Stephany Flores ... it will be measure of justice for Natalee Holloway and ... a measure of closure for her family. BETH HOLLOWAY: And Greta, I was just wanting to say that, you know, like I said, it's been a long time, but it's never too late for justice. And I'd be good with a "Midnight Express" prison anywhere for Joran. "For me, I have a perpetrator in prison, so I can't ask for anything more right now," Beth Holloway said. "That's where he belongs and now I'm able to focus and move onward in the help that I can do for others who have missing loved ones -- maybe they don't have recovery of their loved one's remains or they don't have a perpetrator in prison, so my hope is to shed enough light and to help them." Page created in 2.189 seconds with 20 queries.